(Nanowerk Spotlight) Carbon nanotubes (CNTs) have been acknowledged as the material of the 21st century. They possess unique combination of extraordinary mechanical, electronic, transport, electrical and optical, properties and nanoscale sizes making them suitable for a variety of applications ranging from engineering, electronics, optoelectronics, photonics, space, defence industry, medicine, molecular and biological systems and so on and so forth. Worldwide demand for CNTs is increasing at a rapid pace as applications for the material are being matured. The global market for carbon nanotubes in 2015 has been estimated to be worth about $2.26 billion1; an increase of 45% from 2009 (i.e. ~ $ 1.24 billion). This was due to the growing potential of CNTs in electronics, plastics and energy storage applications and the projected market of CNTs is expected to be around $ 5.64 billion in 2020. In view of the scientific and technological potential of CNTs, it is of immense importance to know who should be credited for their discovery. In the present article, we have made an attempt to give a glimpse into the discovery and early history of this fascinating material for our readers. Thousands of papers are being published every year on CNTs or related areas and most of these papers give credit for the discovery of CNTs to Sumio Iijima of NEC Corporation, Japan, who, in 1991, published a ground-breaking paper in Nature reporting the discovery of multi-walled carbon nanotubes (MWCNTs)2. This paper has been cited over 27,105 times in the literature (as on January 12, 2016, based on Scopus database). This discovery by Iijima has triggered an avalanche of scientific publications and catapulted CNTs onto the global scientific stage. On taking a cursory look at the scientific literature, one generally gets an impression that Sumio Iijima of NEC, Japan is undoubtedly de facto discoverer of carbon nanotubes. Of course, there is no doubt that he has made two seminal contributions to the field, however a careful analysis of the literature suggests that certainly he is not the first one who has reported the existence of CNTs. In a guest editorial for the journal Carbon, Marc Monthioux and Vladimir L. Kuznetsov3 have tried to clear the air by describing the chronological events that led to the discovery of carbon nanotubes. 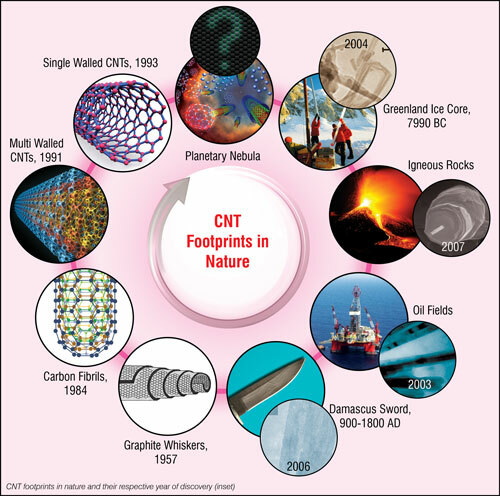 As one delves deeper into the history of carbon nanotubes, it becomes more apparent that the origin of CNTs could be even pre-historic in nature. Recently, Ponomarchuk et al from Russia have reported the presence micro and nano carbon tubes in igneous rocks formed about 250 million years ago4-7. They suggested the possibility of formation of carbon nanotubes during the magmatic processes. It is presumed that the migration of hydrocarbon fluids through the residual melt of the rock groundmass created gas-saturated areas (mostly CH4, CO2, CO) in which condensation and decomposition of hydrocarbon in presence of metal elements resulted in the formation of micro and sub-micron carbon tubes. A wide range of elements (Fe, K, Ti, V, Cr, Mn, Ni, Pt, Zn, Ga, Ge, Br, Sr, Zr, and Pb) have been actually identified in the natural globules of graphite containing micro-and nanoscale structures of igneous rocks by X-ray fluorescence spectroscopy studies. Some of these elements were believed to act as natural catalysts in the formation of carbon nanostructures by process similar to chemical vapor phase deposition. The presence of carbon tubes was confirmed with the aid of electron microscopy. Another most compelling evidence of pre-historic naturally occurring carbon nanotubes (MWCNTs) is based on the TEM studies carried out by Esquivel and Murr8 that analyzed 10,000-year-old Greenland ice core samples and it was suggested that probably they could have been formed during combustion of natural gas/methane during natural processes. However, the validity of this evidence is questionable owing to the lack of clear high-resolution TEM images, high-quality diffraction patterns or Raman spectroscopy data. In addition, other interesting possibility is that the carbon nanotubes could have been directly formed by the transformation of naturally occurring C60 fullerenes in nature without the assistance of man, given the right conditions prevail. Suchanek et al.,9 have actually demonstrated this thesis, under the laboratory environment, by transforming C60 fullerenes into CNTs under hydrothermal conditions. There is a large body of evidence in literature about the existence of naturally occurring fullerenes in nature, e.g., coal, carboneous rocks, interstellar media, etc. Since the above experiments were conducted under the simulated geological environment, their results imply that CNTs may form in natural hydrothermal environment. This hypothesis was further corroborated by Velasco-Santos and co-workers10, when they reported the presence of CNTs in a coal-petroleum mix obtained from an actual oil well, identified by the PEMEX (the Mexican Petroleum Company) as P1, which is located in Mexico's southeast shore. TEM studies revealed that the coal-petroleum mix contained predominantly end-capped CNTs that are nearly 2 µm long with outer diameter varying between few to several tenths of nanometers.